As I’ve journeyed through the world of board games and tasted the flavors and smelled the smells and seen the sights that everyone is familiar with (Settlers, Ascension, Ticket to Ride, Lords of Waterdeep, etc.) I’ve developed a sense for what to expect from a game. It’s not that I judge a book by its cover, but more like I know how a jacket would feel on my shoulders before putting it on – or how a pair of shoes will fit by looking at them on the rack. It’s not often that a game surprises me. 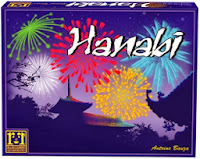 Hanabi is a game that surprised me. On its face, this is a simple game: 50 cards, 5 colors (plus some bonus cards) and 12 cardboard chits. The rules ask you this question: “Can you get these fireworks in order and put on a great show?” The goal is to create 5 stacks of colored cards, numbered 1-5, played in order, with severe limits on the amount and types of information you’re allowed to share with your teammates. Here's the catch – you’re not allowed to look at your own hand. If you’ve never heard the term “Alpha Gamer”, I’ll define it for you here. An Alpha Gamer is the guy or gal who tells you when it’s your move, what your moves could be, what the best move is, and whether or not you’re doing the right thing. These things are usually accompanied by a steady stream of comments about the game – sometimes table talk, sometimes just annoying feedback better left in a job-performance review. You know somebody like this. Heck, you could be thinking of me right now, I’ve certainly been guilty of it in my playgroup. 1) Information isn’t available to all players. Because I can’t see my own hand, I can’t tell you what your best move is, which means I have to constantly think about how to set YOU up for success, based on information I have that you don’t have. 2) The rules prohibit a startling amount of information from being shared. Even if I know what the best play for you is, I’m not allowed to tell you. I know I’m hammering this point home, but it’s an important one to me – this game is fun to play because it requires that each player be an equal and integral part of a problem-solving team. You’ll enjoy Hanabi, regardless of the number of players, if you’re comfortable making mistakes and learning how to communicate effectively with your friends. It feels a bit like playing a co-operative game of spades, hearts, or bridge – everyone on the same team, trying to solve the same problem, working together. Every turn I'm allowed to give one piece of information to another player, a “clue” – I can reach across the table and touch another player’s cards, indicating that they’re either a specific number, or a specific color. Here’s the catch – I can’t just pick one card. I have to describe all the cards that fit the description I’m using. If you’ve got four 1’s of four different colors, I have to point to all four of them. If you’ve got a hand full of green cards, I can’t pick only one. This means clues are used pretty specifically to signal when a player should play or discard a card. Discarding a card is the only way to regenerate clues, of which we're given only eight for the entirety of the game. If eight seems like a lot, think again; most of the game is played under pressure created by the need to discard cards, often blindly, to regenerate clues. Keep the above in mind while I give you the final details – there are a limited number of each card in each color (to be expected), and since we’ve got to build each colored stack from 1-5, in order, if a player discards a card that we’d need later, that stack is now doomed to be worth less at the end of the game. If that’s not enough pressure, if a player attempts to play a card and the card isn’t a legal play – meaning it’s not the next number, in sequence, on its color’s stack – then the “fuse” on the fireworks burns a little more. Three missed plays make the fireworks go off early, and the team’s score is the total of the highest card on each stack. If players manage to avoid an early finale, the game ends with a single extra round after the deck runs out of cards. The game is made for 2-5 players, and is equally enjoyable with any number. I was impressed by how fun it was with just my wife and I playing – it felt like doing a puzzle together, but one where we could each see pieces the other couldn’t. We play a ton of games together, and this was a new experience we enjoyed, particularly because we know we’re good at solving puzzles (the car we won in a scavenger hunt is proof of that) and we enjoy the challenge. If you’ve got kids, I think this would be a pretty neat way to teach critical thinking skills. Even as an adult and a lover of logic puzzles, it isn't easy for me to recognize the best play, or the cleanest path to victory. Hanabi requires forward thinking, listening skills, and logical reasoning, each in large amounts - perfect for developing the minds of our young, adventurous companions. It says a lot to me that I’m thinking about a $15 card game a week after I’ve played it. It fits squarely into my current rotation of GREAT card games – Love Letter, Council of Verona, Coup, and now Hanabi. Pick it up if you’re a lover of logic problems, or if you want a new, surprisingly elegant puzzle to enjoy with your family and friends. Rawr, nerdnight I am learning this. Will do! Or tomorrow night! Is it Ever Okay to Cheat?